“Shin Godzilla” (also known as “Godzilla Resurgence”) is a Japanese science fiction giant monster movie that’s the first in the third reboot of the “Godzilla” film franchise. When a giant monster that has been mutated by radiation threatens Tokyo, the best and brightest in Japan must devise a solution to stop it before it destroys the world. It stars Hiroki Hasegawa (Rando Yaguchi), Satomi Ishihara (Kayoco Anne Paterson), and Yutaka Takenouchi (Hideki Akasaka). The movie is rated PG. “Shin Godzilla” was directed by the person behind “Neon Genesis Evangelion” — Hideaki Anno himself! The Japanese reimagining of Godzilla is much better than the American version a few years ago because it focuses on what audiences come to a Godzilla film to see, which is the massive behemoth himself. It definitely appeals to Japanese film sensibilities, but then, isn’t Godzilla fundamentally a very Japanese concept? There’s something amazingly cathartic about watching a giant monster lay waste to a densely populated city (something that the upcoming Power Rangers movie should definitely learn from). Although it’s ultimately still a man in a suit, albeit a CGI suit generated from the motion capture of a man acting as Godzilla, it’s still fun to watch the oddly human-like movements of Godzilla result in billions of dollars of destruction. Collapsing buildings are always entertaining. Godzilla’s initial appearance has the government in decision paralysis, especially since virtually everything requires the Prime Minister’s approval. Then there’s all the red tape that our protagonists have to wade through, and the politicking that comes with navigating giant organisations. Fortunately (for us), the imbecilic government’s inaction allows Godzilla to reach his full, magnificent potential and showcase his radioactive breath. Whether it’s a homage or an intentional attempt to ape the style of the older “Godzilla” films, the treatment certainly evokes the feel of old “Godzilla” films. It might be a modern take on the topic and the responses of our protagonists are slightly more realistic, but it doesn’t change the fact that they’re behaving very impractically to a very implausible situation. And ultimately, it’s their pluckiness and sheer determination that save the day, which is a hopeful message to include. Godzilla goes through a few evolutions in the course of the film to reach his final, poster-worthy form. But the problem is that his first few forms have gigantic googly eyes that make him look like an adorable, if cross-eyed, lizard. You almost want to throw a Pokeball and catch small Godzilla when you first see him. So when he finally evolves you’re not too scared, because you’ve developed a connection with him when he was a younger, cuter creature. The plan may be approached fairly realistically, but it’s still an incredibly ridiculous plan. Visually, it’s not all that impressive. And as for the execution, it’s hard to fathom why they don’t come up with a more lethal solution for neutralising Godzilla. It’s a way to ensure the franchise continues, but it’s hard to believe why all the nations in the film agreed to it. 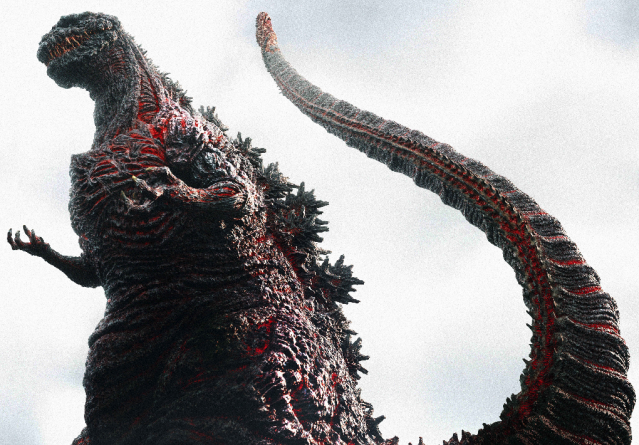 “Shin Godzilla” preserves the feel of “Godzilla” movies while updating it with modern responses. Should you watch this at weekday movie ticket prices? Yes. Should you watch this at weekend movie ticket prices? If you’re a Godzilla fan.